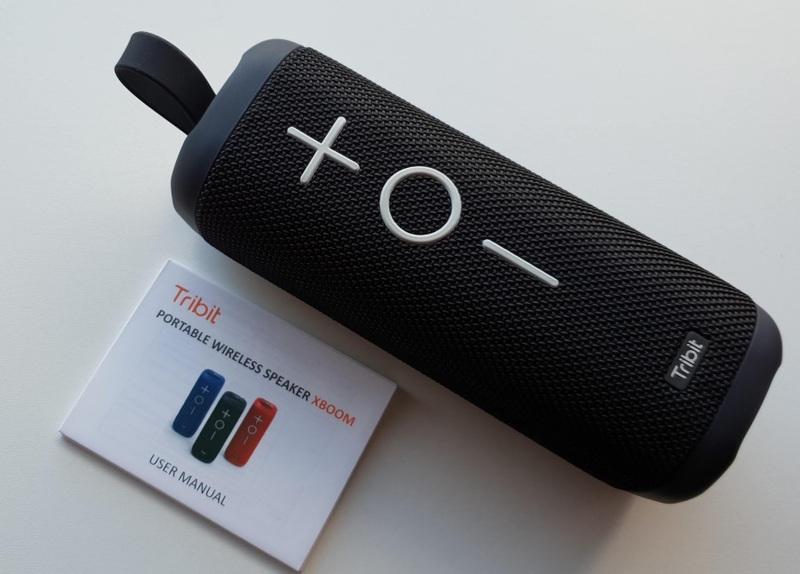 As a writer, I get pitched Bluetooth speakers at the rate of at least one a week, so something has to be special to make me say yes and arrange for a review unit to be sent over. 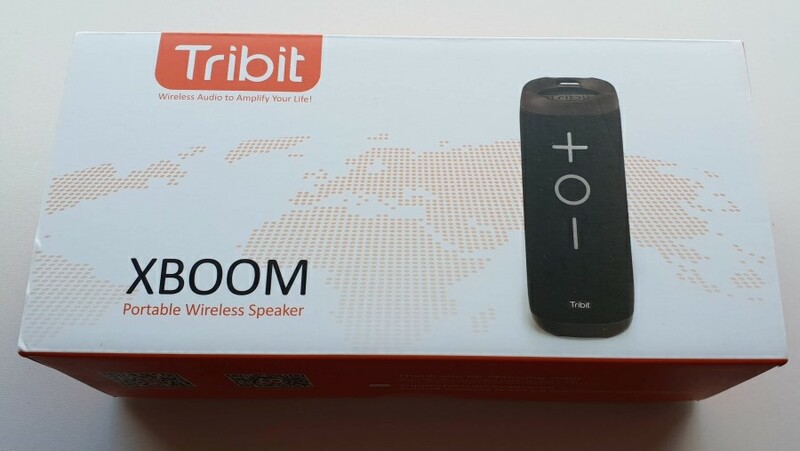 The Tribit XBoom is special - it's fully waterproof, fully rugged, has a genuine 20 hour battery life per charge, and - best of all - it lives up to its name with astonishing volume and bass, thanks to a unique design element. Ignore the box photo, which makes it look like the XBoom is a micro-speaker, it's not. It's just over 17cm long, small enough to go in your backpack or day bag, but too chunky to fit any single pocket. 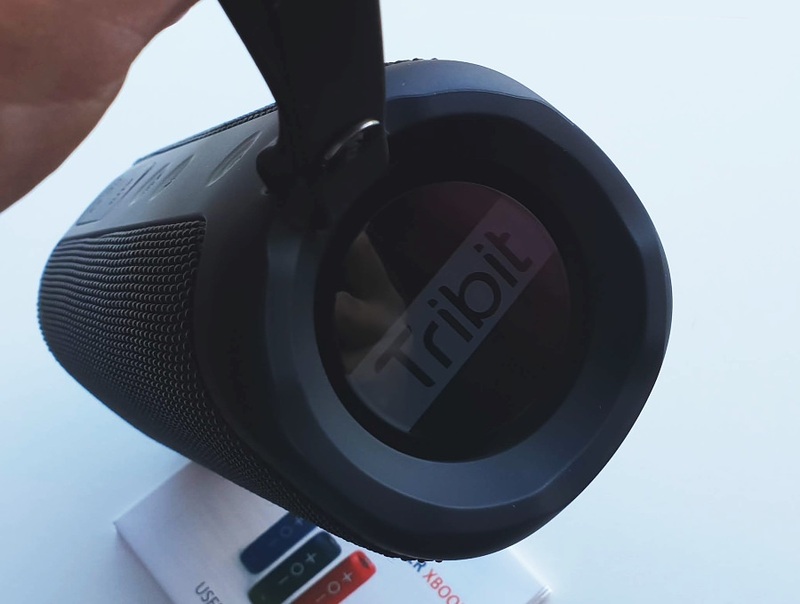 It turns out that Tribit has done its sums just right, because the size is perfect in terms of a compromise between sound reproduction and portability. It comes with a handy carrying/hanging loop, the idea being that you just hang this from a door handle or coat hook or beach tent or whatever, and then the XBoom delivers tunes to all around. Big friendly play/pause and volume adjustment buttons let anyone around control the music, in addition to whatever you're playing music from, e.g. your smartphone. This being a fully waterproof speaker (so pool parties are a go), all the controls are membraned in some way. 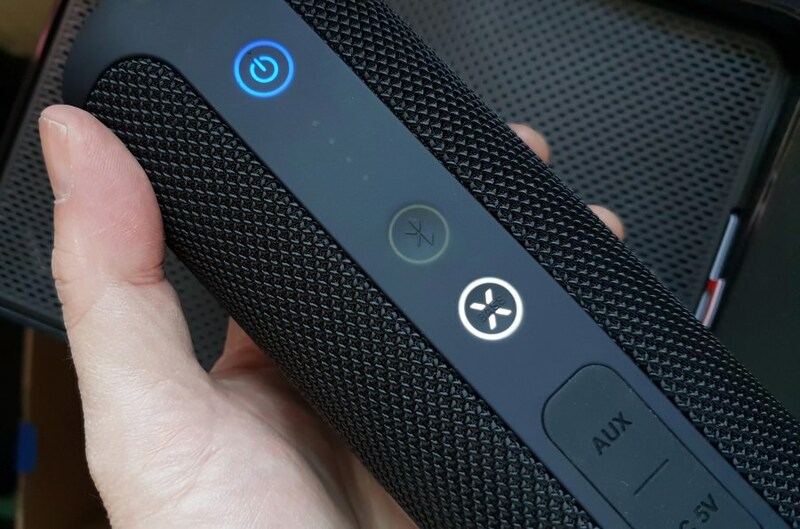 Below is shown the main power on/off, Bluetooth pairing control for adding a second XBoom speaker*, and X-Bass, the pressing of which claims to boost bass frequencies in your incoming audio stream. * You don't get stereo by pairing in this way, it just makes sure that the two speakers are connected together and delivering mono - just twice as loud. Below these are the two jacks, sensibly behind a chunky rubber-sealed flap. 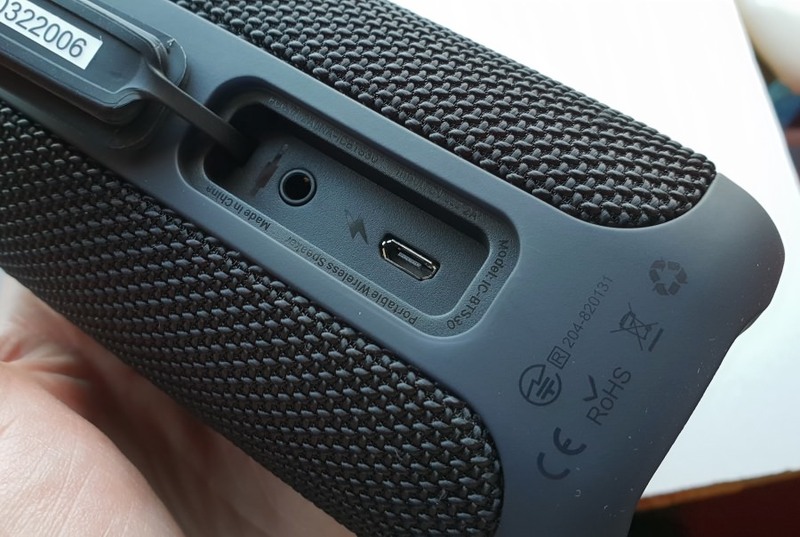 Audio in via 3.5mm (though an AUX cable isn't supplied), should you not want to use Bluetooth, and microUSB to charge the 5200mAh Li-Ion battery inside. Tribit claims 20 hours between charges and I believe them, though cranking up volume and bass right up in my case saw not much more than ten hours. But that's still fine for any use case I can think of. The unique design feature here is that the bass is driven by twin heavy duty speakers at either end. These move in and out - physically - by as much as a centimetre and are fascinating to watch. As music plays, you can see and feel the thud of the bass drum, and so on. The upshot is the loudest portable Bluetooth speaker I've ever tested. When I first connected I was blown away as my hand vibrated from the bass and the room filled with music. And then I realised that it wasn't even close to being on full volume. You're going to get noise complaints wherever you take this, I promise. Which all sounds like hyperbole, but it's true, this is a VERY loud speaker. True, fidelity is lost a bit at full volume, but there has to be a limit somewhere, and I think that Tribit has balanced things nicely here. 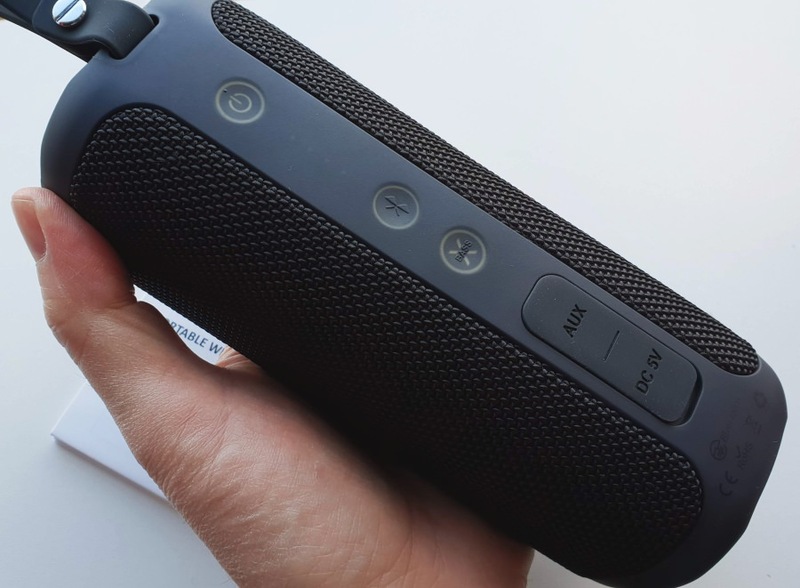 So yes, a really cool and great-sounding Bluetooth speaker that's crying out to be used at garden parties and beach jaunts. Now to the price. As you might expect from the internals and performance, this isn't a cheap no-name gadget, this is a serious piece of kit. It's currently showing, as I write this, at £70 on Amazon UK, making it one of the pricier accessories I've tried, but actual pricing may vary slightly, as is typical for Amazon. I can't say that the XBoom is good 'value', I think the price needed to be closer to £50, but I can say that if price is no object then this is just about the perfect outdoor event speaker for your kit bag.